Single, daisy-shaped flowers in blues that range from sky to amethyst. They show in mid-May here in Northwest Connecticut on 3–6″ stems. Superb used as an underplanting for midseason Tulips. The daisylike flowers of Anemone blanda belong in every garden because they are inexpensive and easy to grow and are the perfect foil for late Daffodils and all the May-blooming Tulips. Their diminutive stature also makes them ideal for carpeting shrub borders and naturalizing in the lawn. All these delightful bulbs need are well-drained soil and plenty of sunshine before the trees leaf out. For best effect, plant with a lavish hand. For more information on growing Anemone, click Growing Guide. I thought I was disappointed and for sure a number of the bulbs didn't come up but the ones that did are so cute and happy that I am going to order more. shipment were very clear. All came up slowly this spring, and anticipation to full flowering was more than rewarded - weeks of a lovely carpet of blue flowers. They put smiles on our faces every time we looked out the window. 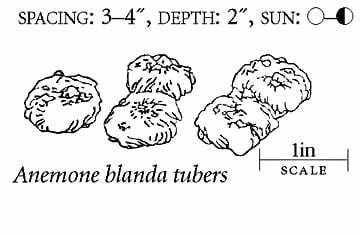 Soak the tubers overnight before planting. Plant 2-3" deep and 3-4" apart in humus-rich soil (10-15 per sq ft). It's difficult to tell tops from bottoms, so we try to plant these small, flattened tubers on their narrower edges. This woodland plant is adaptable to sunny spots, especially in the North.